Would Syrian Refugee Baby Jesus be allowed to immigrate to the US? In this political season in which Syrian refugees have become a political football, it is worthwhile remembering that baby Jesus is depicted by the Bible as being a Syrian political refugee not once but twice. So given that convention, outsiders in places like Alexandria, Egypt, would have considered Joseph, Mary and Jesus to be Syrians. That is, geographical conceptions such as Judah, Galilee, and Roman Judea, would all have been hyponyms or specific places within greater Syria, which was the hypernym. In 135 AD, Roman Judea and Roman Syria were merged administratively into one province called Syria. The wise men or magi from the East and Jesus in the manger are staples of Christmas celebrations. (Matthew does not say there were three wise men, and early Syrian tradition held that there were 12 of them). Actually, however many there were, the wise men caused baby Jesus a very great deal of trouble. 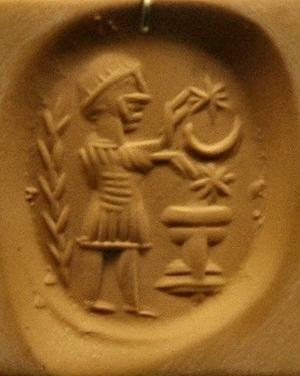 Magi were the priests of the Zoroastrian or Parsi religion of ancient Iran. Iranian religions like Zoroastrianism and Mithraism were present in the Near East. 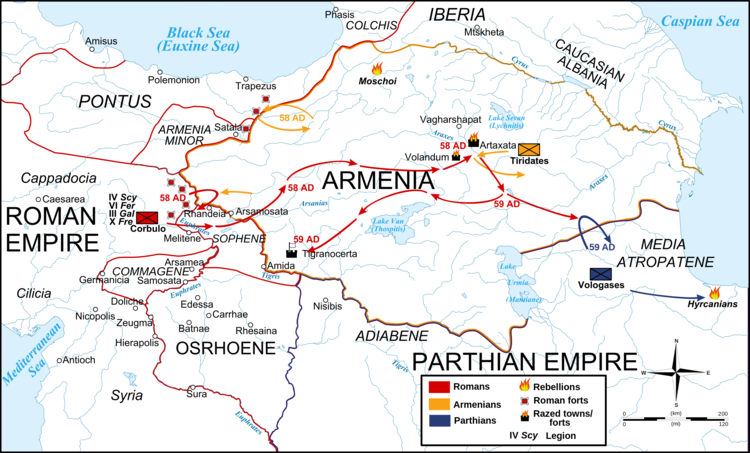 In fact, the Iranian Parthian Empire (250 BC-220 AD), stretching from Afghanistan to Mesopotamia, had taken the the Near East and greater Syria away from Rome briefly for a couple of years some 33 years before Jesus was born. In that couple of years, the Iranians deposed the Rome-appointed local governor, Herod the Great, who fled to Rome, and the Iranians installed the Hasmonean, Antigonus, son of Aristobulus II, as their governor. 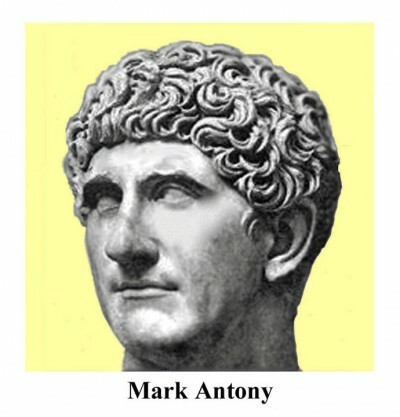 Herod intrigued with Mark Antony, who was planning a counter-offensive, and offered him a bribe, and talked up the Persian threat, so that the Roman senate appointed him king over the territory when Mark Antony took it back. Herod played the same Iran card with the Roman Senate that Binyamin Netanyahu now plays with the US Congress. But once back in power, Herod also did diplomacy with the Iranians fearing that they might come back. So Zoroaster predicted that following a star would lead his priests to a nativity scene, where they would find the world-savior, which they would have called Saoshyant. Oh, no, Iranian religious leaders spreading their religious ideology in Syria! 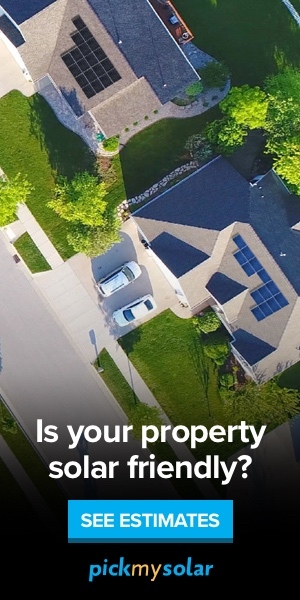 Alert the Republican National Committee! The delegation of wise men from Iran appear to have met with Herod before they went off wandering around looking for the savior. Herod tried to keep good diplomatic relations with the neighboring Parthian Empire, still strong in what is now Iraq, explaining why he might have given the priests safe passage. In any case, an Iranian invasion had deposed Herod once, and he would have been very nervous about Iranian priests spreading end-of-days talk about the rise of an everlasting king. You just have to read the Qumran scrolls to see that some Jewish sects would have been primed for this Iranian message. According to Matthew, their millenarianism got back to Herod. He says that the magi were instructed in a dream not to go back for an audience with Herod after he had been angered by their prophecy, and so they departed directly “to their own country, by another way.” I.e. they sneaked back to Iran, avoiding Herod’s guards. Herod, having heard the Zoroastrian prophecy that the Saoshyant or eternal monarch had just been born, took it literally and was afraid that on reaching adolescence an Iranian-inspired boy-king would dethrone him, just as the Parthian emperor had in 39 BC at the beginning of his career. So he announced he would kill all boy babies 2 years old or less. Matthew says that an angel appeared to Joseph in a dream and warned him and his family to decamp. 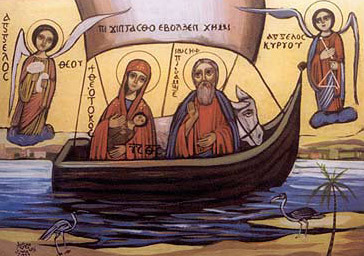 So the flight to Egypt of the holy family was the migration of Syrian refugees from a combination of religious and political persecution. A blanket killing of boy babies is what we would now call a war crime, and Jesus was directly targeted. Like little Aylan Kurdi, who washed up dead on a Turkish beach, he was forced by a violent regime out of his home, to seek refuge in another country. Unlike Aylan, baby Jesus survived the journey to Egypt. The biggest Jewish community in Roman Egypt at that time was in Alexandria, and I have long felt that was where the holy family were likely given asylum. Jesus was probably born around 6 or 5 BC, so Egypt would have been governed by Gaius Turranius. Jews in Alexandria had been given their own quarter and originally had been made equal to Greeks by the Seleucids, but there were tensions between those two communities, and both had tensions with the native Egyptians. Greeks considered Jews to be “atheists” because they rejected the pantheon of gods. Just a little over thirty years before Jesus was born, the Alexandrian Jews had been demoted from being citizens of Alexandria to being just Egyptians. The best status was to be a Roman citizen (as Saul/ St. Paul was), but you couldn’t become a Roman citizen without first being an Alexandrian citizen. The Romans thus abruptly took away from Jews the urban citizenship status they had had since the city was founded by Alexander the Great. In 38 BC there was a riot over these issues between the Greeks and the Jews. (The US Congress has just made Iranian-Americans, Iraqi-Americans and some other ethnicities with dual citizenship second-class citizens by insisting that these citizens of the USA get visas back to the US if they visit Iran or Iraq. Just because you think you are a citizen with full rights doesn’t mean that you will remain that way. Franco took citizenship away from millions of Spanish leftists, and the Bolsheviks took citizenship away from millions of White Russians). 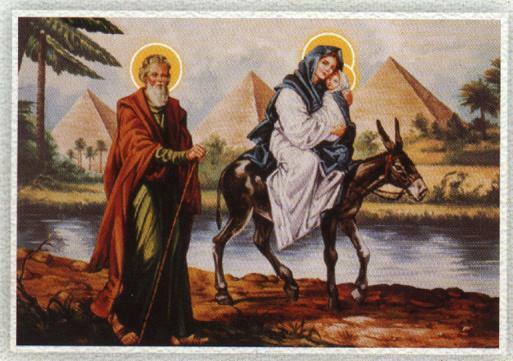 The holy family was probably refugees for just one or two years in Egypt. If they weren’t in Alexandria, they would have been considered “Egyptians” by the Roman authorities, a low status. If they made it to Alexandria, they would have had more rights, but they likely suffered from not having the same religion as the Greek and Roman elite. The Egyptian polytheists, who still worshiped Horus and Anubis, wouldn’t have appreciated foreign “atheists,” either. Joseph was a tektōn (τέκτων), a builder or some say carpenter. If a builder he would have looked for day work, maybe working with stone. There would have been no work for a carpenter in Egypt at all. Egypt doesn’t have trees suitable for woodworking, just palms. Wood has long been imported from Lebanon for the elite, which had cedars. (To this day I have seen Egyptian newlyweds given big wooden dresser drawers, an extremely expensive imported gift, meant to last a lifetime). So it is possible that the holy family was reduced to penury and living on handouts, far from the trees of the Levant that supplied wood for carpentry. They might have been hungry. As they fled through Sinai to Egypt, they would have been thirsty. If Joseph could get no work for a year or two, their clothes might have gotten threadbare or even fallen off their bodies. They may have had to beg. 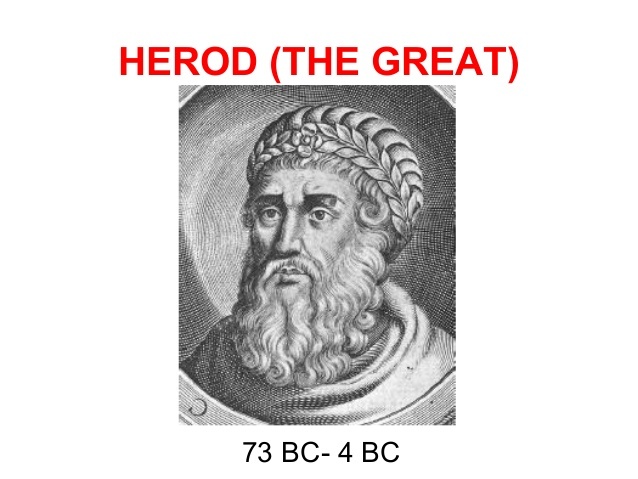 In 4 BC, Herod the Great died. First, the holy family tried to go to Judah in the north, but Herod’s son Archelaus was ruling there as a tyrant, so they had to flee Judah, too. That was when the three of them went to Nazareth in the Galilee, which wasn’t in the territory of Archelaus but in that of Herod Antipas. (This ruler later executed John the Baptist for denouncing his marriage to his niece as incestuous, so the holy family’s hope they would be safe under him was misplaced). So the toddler Jesus got to be a Nazarene because of having been a Syrian refugee twice, once from Herod the Great in Egypt, and once from Archelaus in Judah. Maybe when they were refugees in Egypt, Mary, Joseph and baby Jesus were hungry and thirsty, or lacked proper clothing, having had to flee their homeland abruptly. Maybe Jesus grew up hearing those stories about the Syrian refugees. There are politicians arguing that Syrian refugees should not be admitted to the United States, even though the US has taken in 750,000 refugees since 2001, and only a handful have gotten into security-related trouble. Jeb Bush said that only Christian Syrian refugees should be let in. These American, Christian politicians would not have admitted the holy family when they fled Herod the Great. They were Jews and that was before Christianity. So they were non-Christian Syrian refugees. Out of luck. Maybe they should chisel it above the Capitol building. Oxfam America Syria Donation Page.